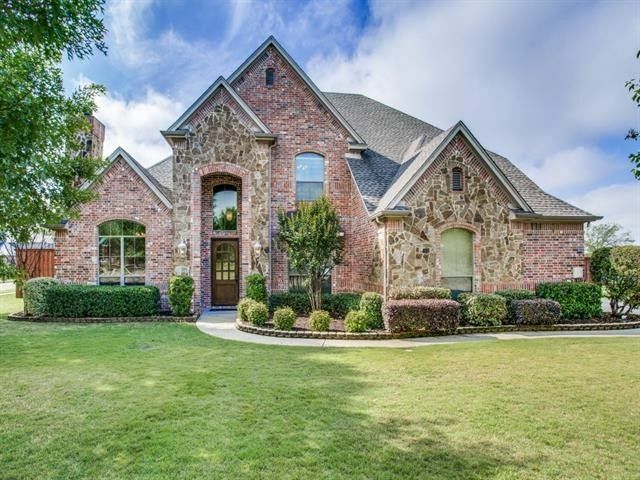 Elegant custom brick & stone home on a premium corner lot backs to a wooded greenbelt & ranch land with a view of a pond & grazing horses. Private backyard features a gleaming gunite pool & spa with a water fall & tanning ledge. Exquisite design & detail throughout include stunning hardwood floors, soaring beamed ceilings, granite countertops, & double crown moldings. Chef's kitchen boasts tea-stained cabinets, stainless appliances, double convection ovens ,a wine bar & an 8x7 walk-in pantry. The private master suite features a luxurious bath with a jetted tub,separate shower, & a 12x10 walk-in closet. Secluded 1st floor guest suite with adjacent full bath. Media room could be 5th bedroom,Gameroom with balcony. Directions: From I35 exit Teasley Lane, Turn Right onto Hobson Lane, Left onto Forrestridge Dr, Right onto El Paseo, Right on Belmont St, left onto Meadowlands.&#xD;&#xA;MULTIPLE OFFERS SITUATION. PLEASE SUBMIT BEST & FINAL OFFERS TO LA BEFORE 10:00 AM ON JUNE 16TH.